In Ep. 001, Tim talks with Brian Perrino, a local business owner in the Jersey Shore area. Apart from being a teacher during the day, Brian owns two small businesses. Brian runs a tutoring business helping students in math and prepping for standardized tests such as the SAT, ACT, and GMAT. Brian also owns a landscaping/gardening business called Allenwood Organics. Allenwood Organics builds custom vegetable gardens for their clients, and helps maintain those gardens throughout the year as well. It’s a great way to save money on produce and eat healthy organic fruits and vegetables! Brian also shares his thoughts on the definition of “being wealthy”, and what he wished he knew about money ten years ago. Enjoy! Tim Mullooly: Welcome to the podcast. This is Tim Mullooly. On this episode, we have a very special guest. My good friend, Brian Perrino, is with us. Brian, you want to say hi to everyone listening out there? Tim Mullooly: Me and Brian have been pretty good friends now for, what, maybe 15 years. I know quite a bit about Brian, but for those listening out there who might not, Brian, you want to give the folks a quick little rundown on you? Tim Mullooly: Like you mentioned, you’re a teacher at the moment. But what we’re going to talk about mostly today is side businesses that you have, as well. You tutor students on the side, right? Brian Perrino: Yes. That’s been going on for quite a while. I would say about six or seven years ago, I started tutoring just math because math was what I primarily focused in in school. Moving forward, I decided that expanding tutoring to include standardized tests like the SAT and the ACT and the GMAT, that would broaden what I could not only do but what I could also maybe have people tutor for me, which helped me out a lot. I was able to have a lot of students come directly to me and then have students filter through me and go to colleagues and friends who are able to tutor those things. Tim Mullooly: How did you get started tutoring people? Was it just someone you knew needed help and then you realized that you could do this as a business? Brian Perrino: Yeah. Everyone who is half-decent at math at some point in their life has asked to tutor someone. I think when that first happened for me, I not only enjoyed it a whole lot but I also immediately saw the opportunity there. Not necessarily the opportunity to capitalize on my friends or to capitalize on people being bad at math, but I more so felt the opportunity to capitalize on the idea that a lot of people need help with this and it is something that I not only enjoy but also hope to have a decent way of explaining. I think that’s how it got started. Tim Mullooly: Cool. Yeah, I know you ask a lot of people in school what are they worst at, and three out of four of them will say math. Brian Perrino: Yeah, it’s the most common subject, in my opinion, especially now. I don’t quite know why, but I think it’s getting worse. I’m not sure. It’s not something that I like. Of course, that’s one of those weird business situations where you benefit from people being worse at something but for some reason, I have noticed that math in particular is not where I would like it to be. Tim Mullooly: Would you think that it has something to do with the amount of technology and resources available to kids today, that they’re not necessarily learning the concepts, that maybe they’re just trying to find shortcuts to learning the math? I don’t know if that has anything to do with it. Brian Perrino: Then there’s the Classical mind, who wants to know how something works. I think that the technology that we have currently conditions Romantic minds as opposed to Classical minds. It’s not the technology itself, it’s the application, the way that we currently are using technology. Brian Perrino: I think that that is conditioning us to be more Romantic in that way of thinking. Tim Mullooly: With kids being slightly worse at math, is it easier to find people to tutor now? Is it all just word of mouth for your business, or do you do any sort of marketing or anything like that? Brian Perrino: That’s a really good question. When it first started, the only marketing that I had was I had an email that my mom sent out to all of the people that, I guess, she knew. It was just saying I was offering math tutoring. Nothing else, it was just math. She knew that it was just get a couple people. It started off with that and I ended up getting a few people that I knew. From there, it slowly spread into people they knew and people they knew, and it was very, very strong in terms of word of mouth. But at some point, it leveled off and it was not substantial. It was not sustainable. Tim Mullooly: There’s only so much word of mouth that can happen. Brian Perrino: Exactly. For whatever reason, instead of advertising a whole bunch more, which I definitely think could have worked, I don’t necessarily know that I’d have found the right outlets, I just expanded what I could tutor. I expanded what I could tutor into SATs and all three subjects in the SATs, and then ACTs, all four subjects on the ACTs. Once I was able to expand those, word of mouth actually did become enough because of how much I could do. Tim Mullooly: In terms of running the actual tutoring business, is there any sort of cost to you that comes with running this business, or is it just your time and scheduling? Brian Perrino: That’s a really good question. I have really positive things to say about starting a low-cost business. However, there are definitely traps that you can let yourself fall into. With this business, right now there are almost no costs. But I think the more important thing is that there were almost no costs starting. I think there are a lot of businesses that have medium to high startup costs that eventually level out and become minimal. But this one started off with almost nothing and has continued to be almost nothing, which I think is really positive. The original cost, other than my education, was basically nothing. Currently now, I invest money into some web design that I’m trying to eventually launch, and then also I do provide materials for students, which includes standardized test booklets, which brings me to my next point, which is the trap that you can get caught in. I read this, that your eventual goal in business is to stop trading your time for money. Is one hour the fee that you charge? Is that what it’s worth to you? Or is one hour building something for you? Now, I think with tutoring in particular you can get yourself caught in a trap where every hour you tutor, you are not growing yourself or your business, especially because you can max out your time. If you’re tutoring from 3:00 p.m. when kids get out of school ’til 8:00 p.m. or 9:00 p.m., whatever you do, those are the hours with which you can tutor. You can do that Monday, Tuesday, Wednesday, Thursday. You can probably do a little bit on Friday, but not many kids want to. You can probably do a little bit on Saturday and a little bit on Sunday, but not many kids want to, as well. Basically, the point is you max out your time at some point. Let’s say you’re tutoring 40 hours a week. You max that out. Now, is improving your name or improving your tutoring skills at that point, is that growing anything for you or are you maxed out? Are you never going to make any more money unless you make a huge change to your business model or start charging more? Now, of course, you can start charging more but at some point, there’s a peak. Tim Mullooly: You can only charge so much. Brian Perrino: You can only charge so much, exactly. I also read one time this great idea. I’ve never done it and I wouldn’t do it to this degree, but it was the idea that you just double your prices and if your client base gets cut in half, you are now making the same amount of money and you have double the free time, yeah, which I thought was very interesting. The only two ways I thought that I could grow this company, or not the “only,” but the two ways that I thought of immediately were, one, get people to tutor for me. It would just be such a time investment for me. Every month or every two months or maybe even every six months, if I’m lucky, I’m training new people and I’m putting more time into that. Again, that is an investment, but I thought maybe there was a bigger one. I think the biggest one that I thought was creating a product and, potentially, a website like a blog. I’m melding them together to write a prep book, and that’s, I think, the main passive income goal. That’s just me trading another hour for another fee. I think the main goal here of this business, of business in general, in my eyes is investing your time as opposed to trading your time. I think the inflection that I said on time acted like I was going to say something different. It should have said, “Investing your time, not trading your time.” I think that’s the moral of everything I could possibly say about the tutoring business. Tim Mullooly: In terms of industry, shifting gears quite a bit, Brian also owns and operates a company called “Allenwood Organics,” which for us in Wall Township, New Jersey, Monmouth County, it’s a local business. Brian, do you want to tell us a little bit about Allenwood Organics and how that got started? I thought, “There are so many people out there who can easily handle the maintenance and easily learn as they go.” Every gardener has killed a plant. I was going to say, “No gardener has never killed a plant.” Every gardener has killed a plant. You’re going to learn as you go and it’s just this fulfilling experience. I decided that I wanted to provide the front loaded service, which basically means taking the hard part out of gardening. Basically the moral of the story is building people gardens. We either build it out of wood like physical gardens, or we just dig up their plot, we build a fence around it, we make sure that it’s going to be safe from animals but also accessible for you, and try to create and foster the nicest environment for these organic vegetables to grow. That’s what we do. Tim Mullooly: You can personalize it pretty much for anyone’s yard, any size or shape or raised or on the ground or whatever people want. Alongside, our friend, Frank, helps and he does a lot of construction in terms of building the gardens. Brian Perrino: Yeah, that’s a really good point to bring up. Every single thing that we do is customizable. Of course, when we first started we decided we wanted to make three or four options that we were going to give people, but we always encouraged people to let us know what their particular need is and what their particular situation is. For example, we just recently started building raised beds that are not raised from the ground, they have legs on them and they’re actually six feet off of the ground. There are many reasons why we would do something like this, but the first reason is space. If someone does not have space on the ground on their property, maybe they live in an apartment and they have a patio, we are able to build a complete raised bed that is not set on the ground at any size. They can grow whatever they want depending on the depth that they choose. Another huge reason for that same design is for people who are a little bit older who don’t want to do the bending down to access their garden. I think that’s something that’s really important. From there, we’ve done all the same basic garden you’ve ever seen or just raised beds on the ground with fences around them. We do fences anywhere from three feet if it’s just keeping out your dogs and your kids and things to eight feet to 10 feet if you have some very athletic deer in the area. Tim Mullooly: You not only build these gardens for the people, but you also offer to help maintain some of the gardens? Or they can call or email with questions, like, “Should my tomatoes be turning black” or something. Brian Perrino: Yeah, the guidance and support. That’s probably the most important thing that we offer. We not only build the gardens, but I did fail to mention we bring in the compost and the plants. Always organic plants. We start ourselves from organic seeds or we get from a local source or at least as local as we can possibly get, which we try to be as transparent as possible about. Once we plant the garden, we don’t leave and leave you with nothing. Of course, we do try to talk you through the season and what you should expect and when you should start weeding and when you should start watering a little bit more, a little bit less, and adjust based on the plants and based on the area that you have your garden in. Most of the time, we give them a quick response, send them to a link where we know there’s some really good, useful information, or go to the garden and check it out and see what’s going on there. That’s more on the consultation basis. But absolutely, I think it’s really, really important that we offer continued support. Like we said, we’re trying to take the hard part off of gardening and give you an opportunity to educate yourself with our help as to how to grow vegetables, and then also enjoy the results. Tim Mullooly: We talked about the ways that you marketed your tutoring business. Is there any ways that you guys try and spread this business? I know you have a Facebook page and a website. I’ll link to all that in the show notes on the website. But how do you guys grow Allenwood Organics? 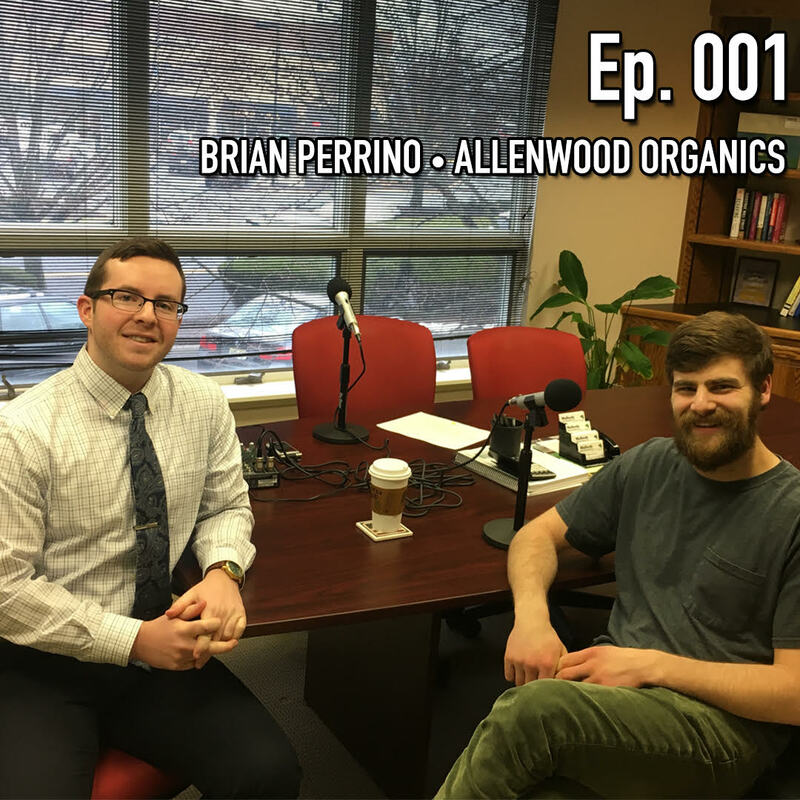 Brian Perrino: Allenwood Organics is a much more marketable business. I’m not saying that the tutoring isn’t, but Allenwood Organics lends itself really well to marketing. We do a whole bunch of forms of marketing, but all very low-cost. Like I said, something I really like to talk about is just low, low, low-cost businesses. The tutoring business, in particular, can be so profitable with such little initial investment and investment overhead along the way. Allenwood Organics, the ways that we tend to advertise, really, of course we have our website. Frank has the magnets on is car which, surprisingly, work quite well. We run ads through social media. We just recently had a video made. Tim Mullooly: I saw that on Facebook. Brian Perrino: Yeah. We’re running ads through not only Facebook, but Instagram and several different streams of social media where we feel our client base is going quite frequently. Tim Mullooly: For something like gardening business, where you can see the results very tangibly, I feel like Instagram and Facebook is a great place to advertise. It’s still relatively cheap to do that, as well. Tim Mullooly: Tips, better ways to be healthy. Brian Perrino: Exactly. I think that those platforms have actually worked really well for us. That’s pretty much the extent. We don’t do much on top of that. The one thing that we do do, though, is whenever we can, and I think this is one of the most important things I’ve ever learned about business, we trade our time for marketing materials. We will build a garden. For example, we built a garden for someone who ended up making a video for us. We traded. We built them a garden and they made the video for us. I think that investing your time is one of the best ways to help your business grow. At the end of the day, you don’t lose anything. Like we said, ideally, you’re not trading your time for money. You’re investing your time. That is an investment. Some investments don’t blossom in the way that you expected, and that’s okay. But it think that investing your time in marketing is really important. It’s more important than throwing money at it. That’s, I guess, why both of the business that I have, like I said, are so low-cost. Tim Mullooly: Great. Now that we know about your two businesses that you run, we have some more conceptual questions, so to speak, in terms of money and wealth and how you think about them and, maybe, points of view that you think are important for people think about, as well. Just one question here. How would you define being wealthy? I feel like it’s different for everybody. I’d like to get your take on what the word “wealthy” means to you. Brian Perrino: In my opinion, that’s a really, really good question. I think trying to answer this question really helps you define your values as a person and your goals as a person. Even if you don’t want all the money in the world or all the abundance of things, being wealthy is a word that describes, in my opinion, being comfortable financially. The way that I define wealthy, I think I have two really big definitions. I think the first definition is the classic, everyone thinks about it, having an abundance of resources, having an abundance of money. Now, if the way that I defined it in that scenario is having the amount of money to retire comfortably at the age you are currently at, that is what wealth is to me. That’s one of my definitions of wealth. For example, $500,000. You win the lottery. Not the big lottery, but you win $500,000 or you get an inheritance or something. That is not wealth to me. That doesn’t mean much at all to me because it will run out. It does not give you the freedom. Of course, it makes a lot of things easier for you and you can invest in a lot of things, but that is not wealth by any means. The first definition of wealth is enough to comfortably retire at the age that you are currently at. The other form of wealth, the more attainable form of wealth, because the only way you can really attain that is to fall into it, in my opinion, one way or another. The other form of wealth, I think, the more attainable, the more logical, the less romantic idea of wealth would be a point where, of course, you should have money. Money in the bank, some amount, some amount of resources. Let’s say instead of the six months that they suggest, let’s say that you have two years. But you have built yourself guaranteed passive or non-passive income that will consistently stick with you for the foreseeable future. That’s, I think, what I see as wealth. I see wealth as having invested in some sort of situation, typically not working for someone else, typically in your own particular business, a situation where you have guaranteed income, whether it’s from your money, whether it’s from a business that you’ve invested your time in or your money in, or it’s just from whatever job that you might have that you are very, very confident you will continue to have. I think that’s where I define wealth for myself. Having the resources so I am absolutely prepared for anything that could happen, but feeling completely confident that money is coming in and more than what I need will be there. Tim Mullooly: Right. Using that monetary amount, from a mindset point of view, like you said before, comfortable, confident. There’s no worry in the back of your mind that you’re going to run out of money or something’s going to happen. Brian Perrino: Sure. To me, that’s wealth. The wealth is you are never worried about running out because you have but you don’t have to have a lot. You have some amount. Brian Perrino: But you’ve worked very hard to get yourself guaranteed income. Like we said, a lot of people do that through passive income streams, but a lot of people build up businesses from that. I think that’s really important. I think another way that you could define wealth that I think no one really thinks about, when you first asked me I didn’t even think about this, but as I started talking I realized I would actually also define it as having more than you need, changing your lifestyle. Tim Mullooly: Much more than you need. Brian Perrino: Much more than you need. You’re in a situation where even if something bad happens, you have that level of comfort where your standard of living is so much lower than what you’re making. I think that’s really important. Wealth, someone who’s living off of $10,000 a year can feel wealthy making $20,000 a year, but someone who’s making $90,000 a year won’t feel wealthy unless they’re making $150,000 a year. You know what I’m saying? Brian Perrino: Wealth also depends on your own lifestyle and what you can turn that money into. I think that’s really important. Tim Mullooly: Yeah. That answer’s, definitely, it’s different for everyone. Like you said, it depends on how much you need and how much you make. That’s why we like to ask that. A couple more questions here. One thing that I always like to ask people, going back to the point where personal finance and money tips and concepts aren’t really taught too much in regular high school, what’s one thing that you wish you knew 10 years ago about money that you know now? Tim Mullooly: Summer jobs together. Brian Perrino: Yeah, in 100-degree weather, completely stressing over nothing. I think that I looked at money as something you should always be trying to attain as opposed to something that lets you do things. Now, maybe then I would even say on top of that, start investing in something in yourself. You know what I mean? Like I said, you’re making money at that age until right now. You’re trading your time for money. You’re trading your time for money. You’re making a little bit of an investment in yourself because you’re gaining resume experience, whatever. Of course, that’s important, but at that level, not necessarily as important as it is. But start working towards something bigger. There always should be something bigger. It doesn’t necessarily have to be something that makes you more money, but it has to be something that you feel is growth for you. Tim Mullooly: I like that. Piggybacking on that, using money as a means to an end, what would you say is your “end?” To more clearly say that, apart from work in these two businesses, which clearly you have passion about, what does earning money allow you to do that makes you happy? What’s your endgame in terms of making money? Brian Perrino: Yeah. My endgame is time. I want to stop feeling rushed in any sense. I think that being relaxed and not feeling stress. Again, I think stress is very important because I think stress, at some level, motivates you to do anything. If you didn’t have any stress in the world then you probably wouldn’t push yourself to do anything. But I think I mean the wrong types of stress. For me, my main goal, the end if money is a means to the end, then the end is the money just funding a normal lifestyle where I’m free to try to make myself the best person that I can be, which would involve, to romanticize it, a lot more reading, a lot more thinking, just a lot more working on myself as a person and a lot less trading my time, like we said, for money. Tim Mullooly: I like that answer a lot as opposed to saying, “I want to use my money to go out and buy all of these things.” You just want to have enough money to be able to relax and live your life and have the freedom to pretty much do as you please. Brian Perrino: Exactly. “As I please” means to just live simply. I think that’s the important part. It’s almost like your goal is to not want anything. That’s your goal. I feel like that’s the main goal of life, now that I think about it. The main goal of life- There we go. This is where I wanted to get. Now we’re here. Alright, the main goal of life, in my opinion, is to stop wanting anything. We have unlimited wants and we have limited resources. That’s just the general concept of the world, the general way that the world works. To not want anything is to win, I think. I don’t think of life as a game at all. I don’t think of successful people as winners and not successful people as losers. I really don’t like that. I don’t like that terminology at all. But I actually think of that as a win. If you look at life and you consider what it is and you realize that the only thing motivating you to do all the not necessarily great things that you might feel you do and people around you is because of their want and their need. Yeah, I think the goal is to not want anything, to be happy with what you have, I guess, is it. Tim Mullooly: I’d have to agree with that. Brian, thanks for coming on the podcast today. I really appreciate you taking time to answer some of our questions. Brian Perrino: Thank you very much for having me. This is very nice. Thank you. Tim Mullooly: If anyone out there has any kids looking to need some help in math or taking some standardized tests, we’ll put some contact information for Brian in the show notes, as well as links to Allenwood Organics’ Facebook page and the website and some email, as well, so you can get in contact with Brian. If you’re listening to this on iTunes, please subscribe to the podcast to get new episodes every week. Feel free to leave us a review or a comment because it would really mean a lot to us. Be sure to follow us on Twitter and Instagram @LWM_Podcast for more news and updates about the show. Again, Brian, thanks for coming on and thanks to all of you out there for listening. We’ll see you next episode on Living with Money.